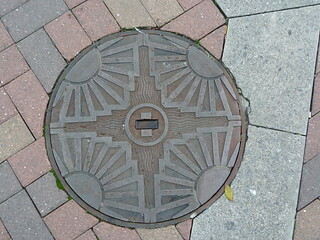 Sometimes it pays to look down to find beauty. 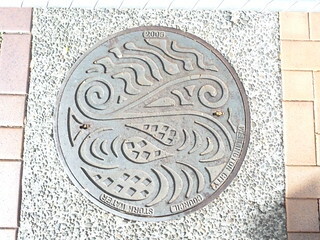 Like these New Zealand manhole covers. 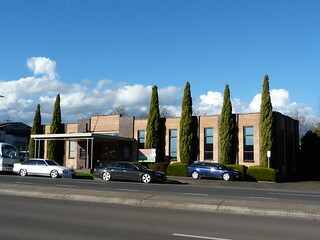 I don't know much about this building at all but I pass it very often since it is on the way into Warragul off the second freeway exit. 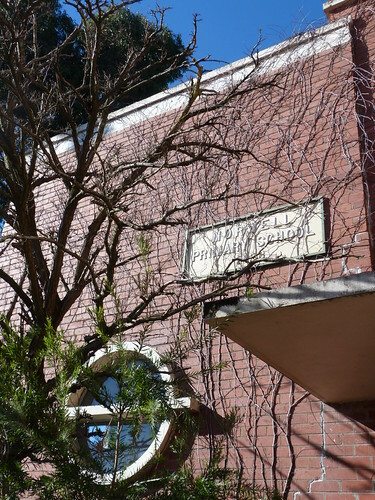 Signage in front of the building indicates that it was once the home of the Warragul Playgroup, a childminding centre I presume, but I am fairly sure that it is no longer used for that purpose. 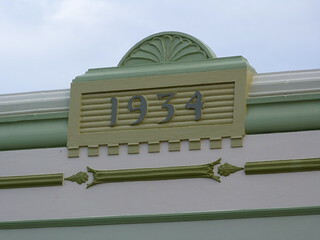 Lettering on the front edge of the awning reads 'Exhibition Hall' so I guess that is another former use. 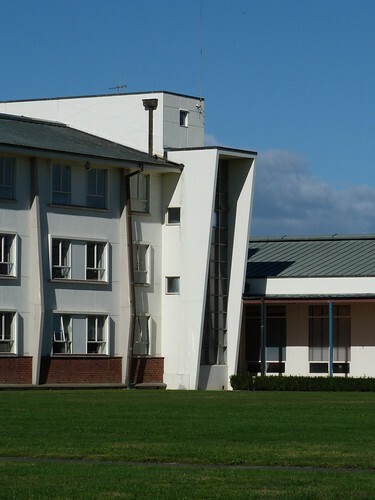 Sometimes when I've been going past there as been some activity in the building. 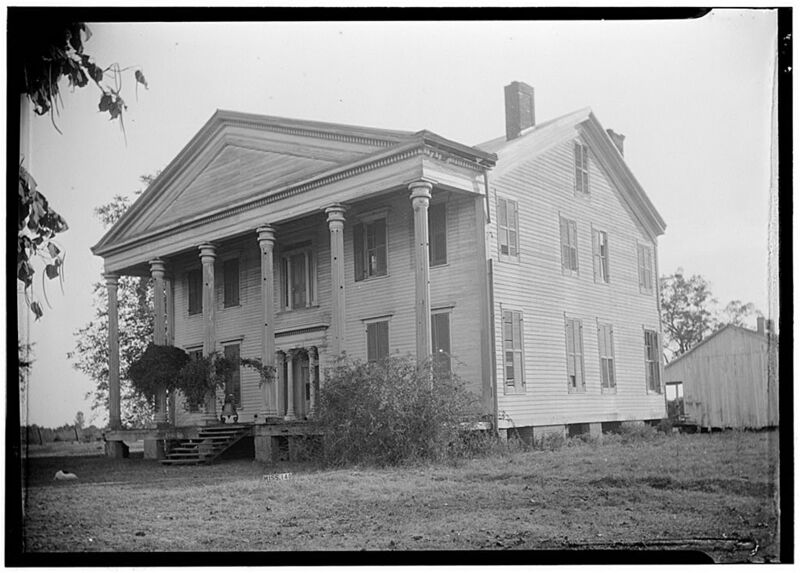 I can recall a plant seller operating out of it for a few days and a bookseller at another time but theses occupations have been short-lived one-off events. 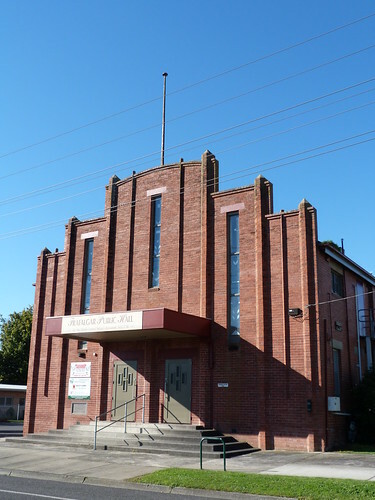 It is 'on the wrong side of the tracks', so cut off by the Gippsland railway line, it is a bit of a hike from Warragul's commercial centre. 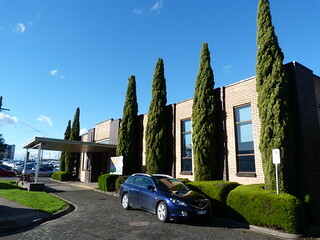 Still, it is an attractive building and looks great in the afternoon sun against a blue sky. 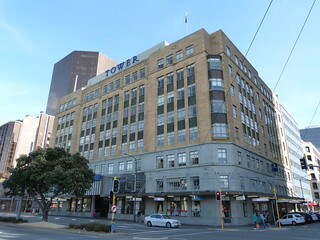 I suspect the pencil pines are part of the original planting since they are now taller than the building but they have been placed to reinforce the regular spacing of the windows. 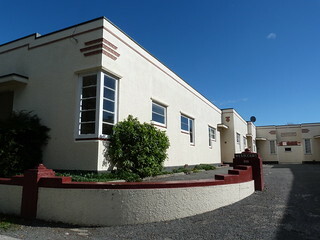 A nice corner Deco building from 1934 in Napier, NZ. 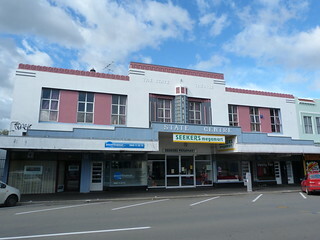 According to the Cinema Treasures website, the State Theatre in Masterton, NZ was built in the 1930s. 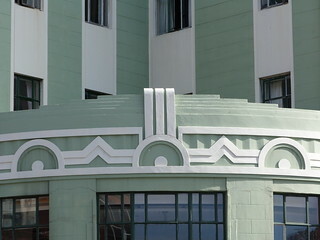 The decoration around the upper storey windows and the leadlight windows in the shops at street level confirm the deco connection. 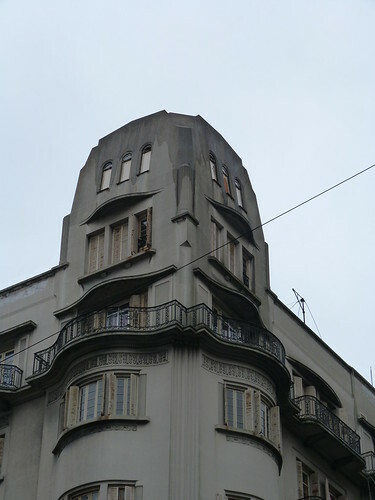 If you've been paying attention you will remember I posted some photos of an amazing bathroom in a house in the Rio suburb of Urca. 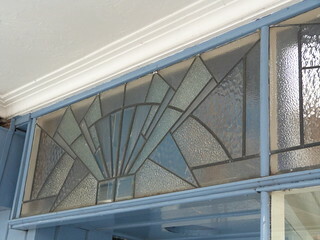 I also posted some pics of the front door with figures of a hunter and a gazelle incorporated into the metal work. 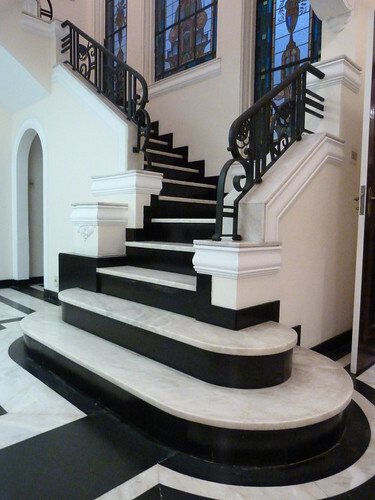 This is the staircase that greets you once you get inside that front door. 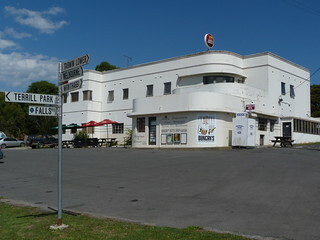 The Fish Creek, better known locally as the Fishy Pub. 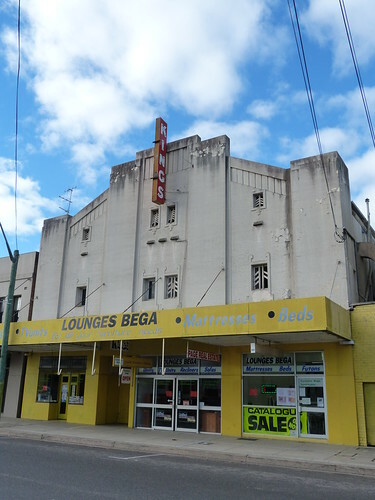 The Kings Theatre in Bega opened in 1935 and closed in 1992. 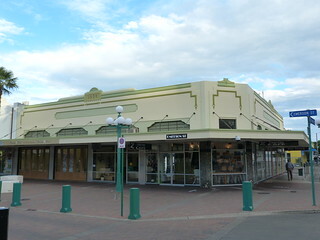 Since then there has been talk of setting it up as a regional performing arts space. 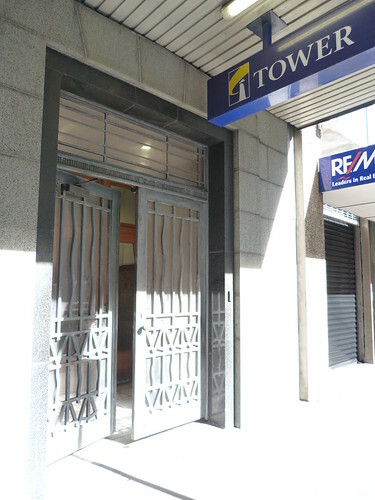 I'm not sure what the current status is but you can see that there is a furniture store firmly entrenched on the ground floor. 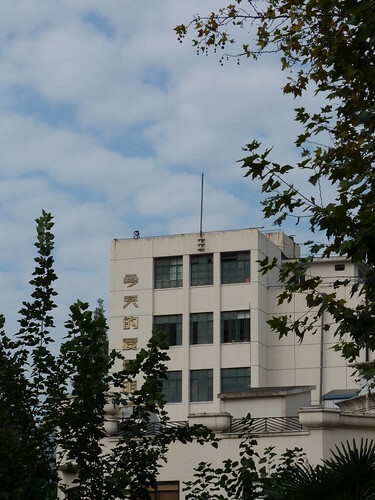 I spotted this building off one of the major streets in Shanghai. 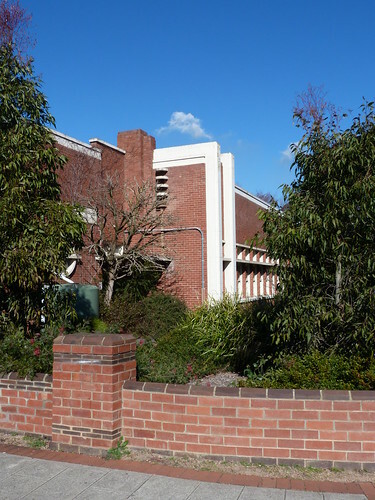 I liked the view of the building through the trees with the cloud-filled sky in the background. 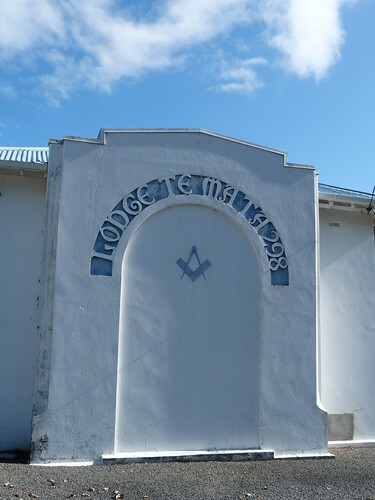 The foundation stone, laid by the Hon. 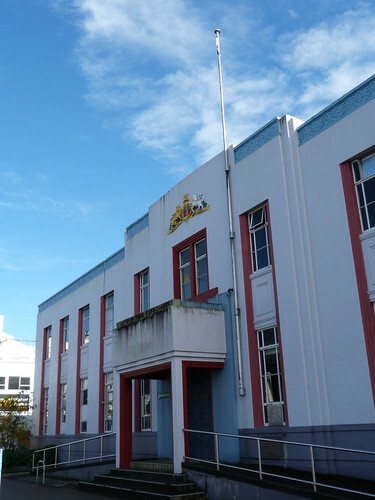 Peter Fraser, Minister in Charge of the Police Department on 28 Sep 1938, indicates that the police station in Palmerston North was designed by the Government Architect, J T Mair. 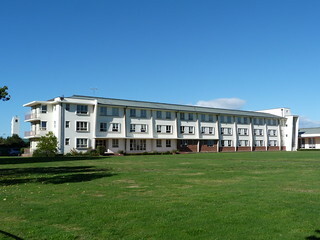 The Commercial Road Primary School (State School No 2136) was established in 1879 and moved to this site in the early 1880s. 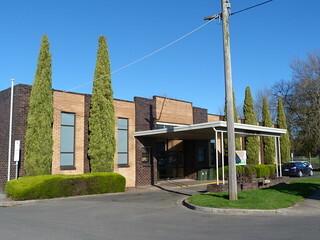 The timber school room still stands on the site but this is the later brick building designed by the Victorian Public Works Department under Percy Everitt. 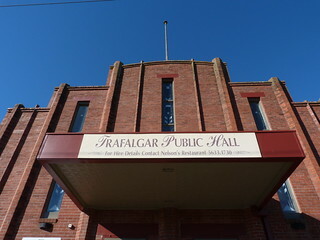 There's a great public hall in the small Gippsland town of Trafalgar. 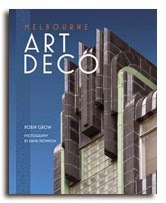 The architect was F C Purnell and the foundation stone was laid by the Hon M McGregor MLC on 17 August 1934. 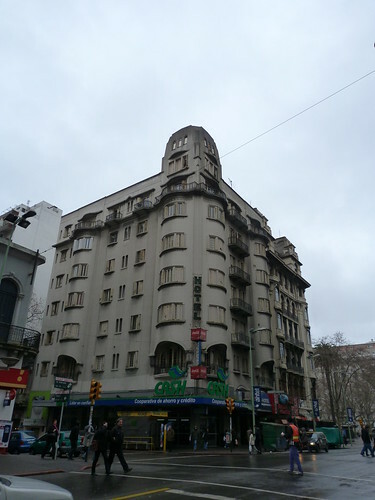 This is the Hotel Aramaya on 18 de Julio Ave in Montevideo. 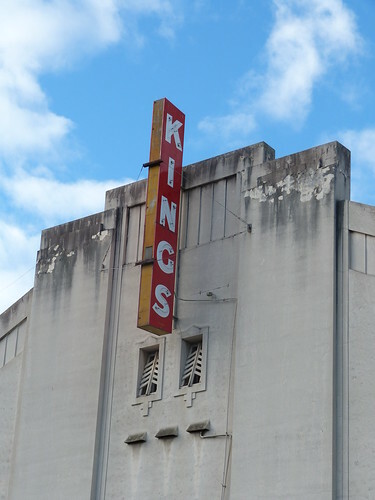 I'd love to find out some more information about the building. 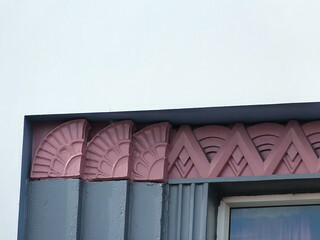 I can see some stripped back Art Nouveau lines in the shape of the windows and railings but also some Art Deco lines, particularly on the corner tower. 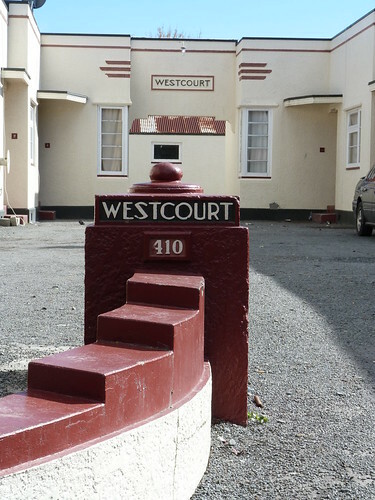 Westcourt, in Hastings, is a nice apartment block arranged in a 'U' shape around a courtyard. 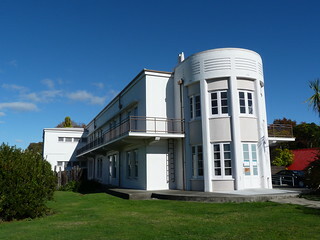 Here is a couple of buildings on the grounds of the Hastings Hospital off Omahu Road. 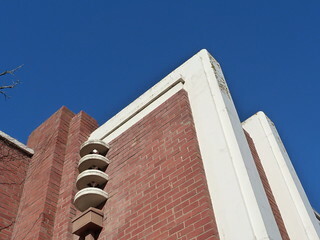 The first has a curved end while the second block in the distance has some Modernist touches. 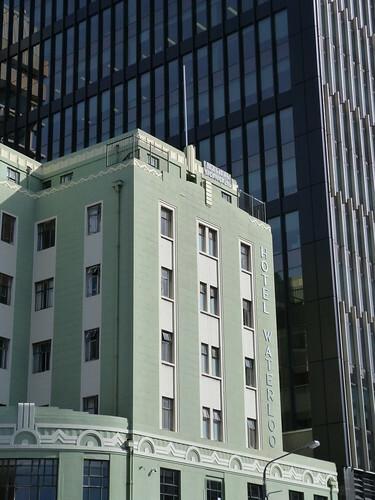 If you look at the sign above the corner entrance, you'll see that this is the Wellington Downtown Backpackers but in a former life it was the Hotel Waterloo. 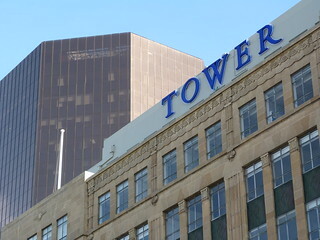 You can still see the old name on the façade of the building. 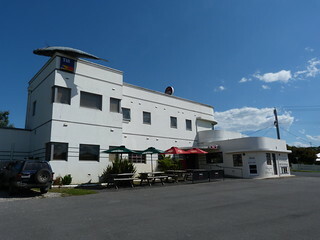 The hotel was designed by Atkins & Mitchell and built for New Zealand Breweries in 1937. 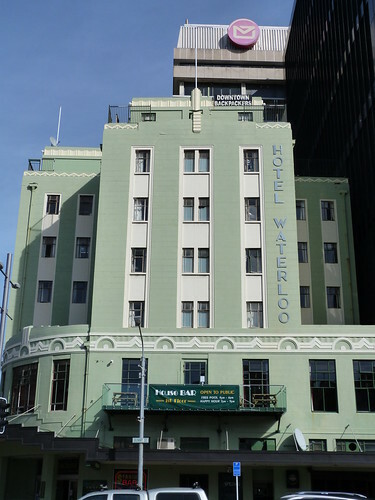 By the 1980s the hotel had fallen into decline and by the end of the decade had closed down. 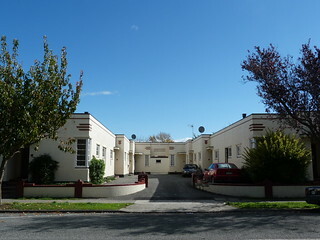 Thankfully the closure didn't last too long and in the early 1990s it was reopened as a backpacker's hostel. 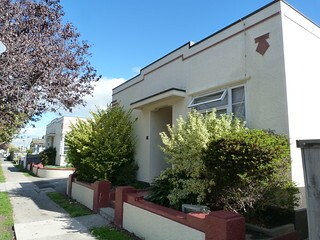 No doubt its location opposite the Central Railway Station helped in this regard. 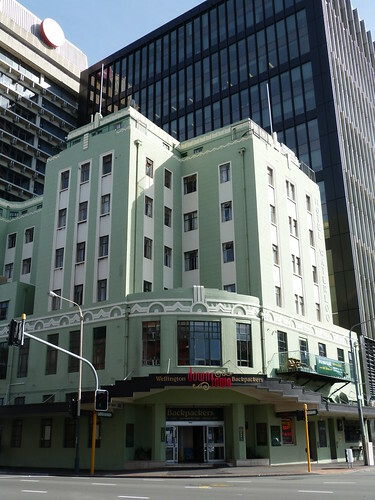 The Tower Corporation Building in Customhouse Quay, Wellington despite its obvious bulk has some nice deco details which you can see along the original roofline, the spandrels and the panels below the windows. 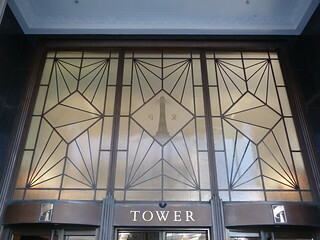 The glass above the main entrance is a real standout. 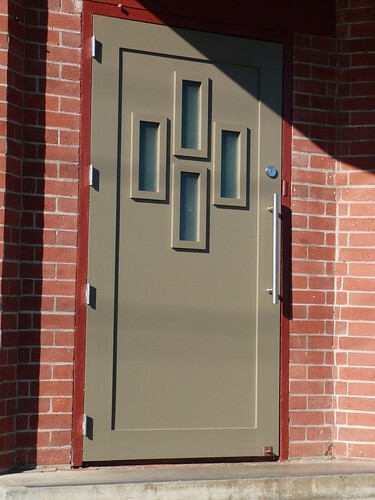 And the side door isn't bad either. 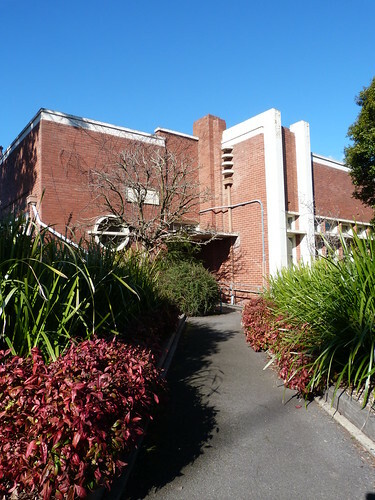 The building was designed by architect J T Mair and the foundation stone was laid on 5th October 1936.